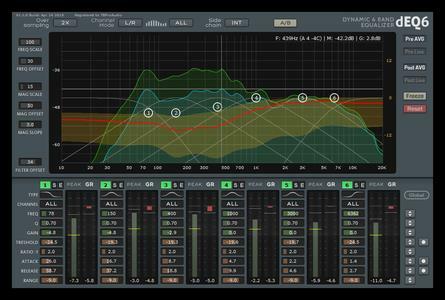 dEQ6 is a 6 band stereo/MS dynamic equalizer with high quality oversampling and accurate spectrum analyzer. dEQ6 controls the filter gain of each band by a compressor/expander. This reduces or increases the gain in a specific frequency range, depending on the program material. The detector signal for the compressor/expander is processed by a pre filter which is controlled by the centre frequency and Q-factor of the dynamic filter. This ensures that the compressor/expander is only activated by content in the specified frequency range.